Editor’s Note: An attorney shares what home inspectors (and agents/brokers) should be concerned about when dealing with vacant properties. I can usually tell when the real estate market is picking up by the number of claims against home inspectors that are sent to me by inspectors and their insurers. The number of claims generally rises and falls with the transaction market. I used to tell trucking clients that if they are on the road for thousands of miles it is inevitable that you will be involved in some form of accident, regardless of fault. This holds true for inspectors and agents as well. If you’re doing more inspections/transactions, your chances of getting a claim increase regardless of fault. Unfortunately the economy is still feeling the aftereffects of the downturn, and many homeowners are still losing their homes to foreclosures and other financial pitfalls. The result is that many home inspectors are inspecting bank owned and otherwise vacant properties. Vacant properties can be challenging because of several factors. The two most prevalent for inspectors involve utilities and the condition of vacant homes adjoining the inspected home. I recently had two cases where it was alleged that the inspector turned on the water service within an inspected property. In the first, it was alleged the inspector filled the tub and failed to shut the water off or open the tub drain. This, not surprisingly, caused significant water damage to the home. The seller submitted an insurance claim and the seller’s insurance carrier made a subrogation claim to recover the cost of repairs. The inspector and his client were present for the inspection, but the client was not with the inspector when the bathroom was inspected. The inspector took no photographs of the bathroom. I know the inspector and I am quite sure he did not leave water running in the bathroom. He’s meticulous and goes back through every home he inspects before he leaves to make sure nothing was left on. Unfortunately my opinion is not a good defense to the subrogation claim. We responded to the claim and asked for proof that the inspector failed to turn off the tub faucet. As expected, the “proof” was that the inspector was there and nothing more. In fact, the damage was not discovered until a few weeks after the inspection. Several people had access to the home during that time period. We called the insurance carrier’s bluff, and the claim went away. Unfortunately not every claimant goes away so easily, and as a result, we must always focus on ways we can prevent the claim letter from ever being issued to the inspector. Even if you are right, it costs money to hire an attorney or submit a claim to your insurance carrier. Pictures are worth a thousand words and sometimes a thousand dollars as well. The easiest way for an inspector to prevent a claim like the one described above is to photograph the tub being filled and the tub being drained and shut off. The same is true for any plumbing component that is tested for flow and drainage. An extra 25 seconds to take two photographs would seem invaluable if the alternative is having to prove in court or arbitration that the water was drained and shut off. In another recent claim, my client inspected a vacant condominium unit that was owned by a bank after a foreclosure. A few days after the inspection, the owner of the unit below the inspected unit reported flooding coming from the inspected unit above. The owner of the lower unit contacted the real estate agent for the bank and reported the claim. Unfortunately for this inspector, the real estate agent told the bank that he was certain the water service was not on in the inspected unit, and that the inspector must have turned the water on, and an alleged “slow leak” present in the inspected unit caused the flooding in the unit below. A year later, after the owner of the lower unit got fed up with trying to negotiate a resolution with the bank, a lawsuit was filed and the bank joined the inspector as a defendant, alleging the inspector turned on the water during the inspection. Nearly every set of standards of practice for home inspectors provide that an inspector is not required to turn on the water service to inspect a building, and generally an inspector will not turn on the water in a vacant building because of the possibility of a hidden pitfall in the plumbing system. I have no doubt my client did not turn on the water service to conduct the inspection. But since this claim was in litigation, a simple letter explaining the lack of liability on the part of my client was not sufficient to eliminate the claim. My client identified several components of the plumbing system that were leaking at the time of the inspection. When the inspector ran the dishwasher it leaked all over the kitchen floor. The inspector works in a state where the standards of practice forbid him from disclosing any information gained during the inspection with third parties unless the condition creates a significant risk of injury to the owner of the property. Water leaks do not meet this definition, so the inspector was unable to contact the owner and disclose the condition. Thankfully the buyer’s real estate agent was present for the inspection. The agent wrote an e-mail to the bank’s agent a few days after the inspection which indicated that as soon as the agent and inspector entered the unit there was water on the floor in the bathroom emanating from a plumbing leak. Unfortunately inspectors are often alone during inspections of vacant properties, and a witness is not always available to bolster the inspector’s defense. After we extricated the inspector from the case, he asked me how he could prevent another claim like this in the future. My suggestion was to note in the body of the inspection report for a vacant property that the water was on when the inspector arrived to the site. An inspector will almost always note when the water or any other utility service is not activated for the inspection. But sometimes it’s necessary to document conditions that are not abnormal or an impediment to the inspection. If the inspector makes it a point to note that a utility is on at the time of the inspection, it could diffuse a similar claim in the future. It’s not always the inspected property that is vacant. Sometimes an adjoining vacant property can have a negative impact on an inspected property. Agents generally know this but many inspectors do not consider it. Consider a semi-detached home where the adjoining property is vacant. Certainly water issues arising in the vacant home can manifest in the inspected home and can be visible and readily accessible to the inspector. Structural concerns may not be so visible. The effects of structural and foundation issues in the vacant adjoining building can be easily hidden, fraudulently or otherwise, with paint, carpeting, sealing of cracks and other routine things sellers do to give a property an aesthetic boost. No inspector is required to speculate on the condition of a property that is not within the scope of an inspection. However, inspectors need to be in the business of preventing the possibility of claims, not reacting to them. The financial exposure (even when the inspector is right) is too significant to behave differently. The best advice I can provide is to make proactive statements in the body of the inspection report. When inspecting a semi-detached or duplex home, note that conditions of the adjoining property can have a negative effect on the inspected property, and that those conditions are beyond the scope of the inspection. There is no prohibition on giving your client some homework. Make the client aware of the issue and let the client take the next steps to investigate the adjoining property. This type of advice is not required by the standards, but could serve to eliminate the probability of the client coming back to you when the adjoining property causes damage to the inspected property. Inspectors have to play with the cards they are dealt. Unlike gambling in a casino, an inspector can put aces under the table and up a sleeve to prevent a losing hand. Taking proactive steps to prevent claims involving vacant properties are your aces, and you always play the aces. Attorney Joe Denneler provides inspection contracts written to the home inspection standards applicable and specific to your state. OREP Insureds enjoy 25% off these services. You can contact Joe directly at JDenneler@srstlaw.com or if you’re an OREP Insured and would like your discount code, email subscription@workingre.com. 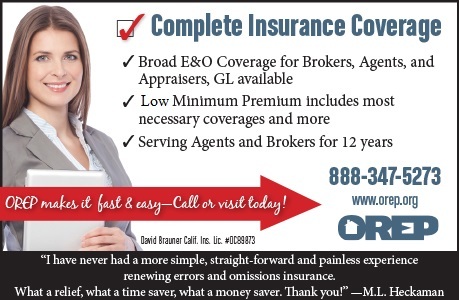 OREP provides broad coverage insurance policies specifically for real estate agents and brokers as well as appraisers and home inspectors. 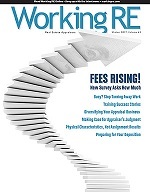 Working RE is a national publication serving real estate agents and brokers, appraisers and home inspectors. WRE is published by the Organization of Real Estate Professionals (OREP), providing E&O insurance to real estate agents/brokers, appraisers and home inspectors for over 15 years.